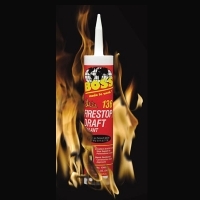 BOSS 136 Firestop/Draft Sealant is formulated with non-combustible inorganic materials to help prevent the spread of fire, smoke and toxic gases through construction openings including around pipes, ducts, vents, electrical wiring, masonry and other penetrations in the building envelope. It is the ideal product for residential construction and meets all sections of the newly adopted International Residential Building Code. In addition, adhesion properties are superior to other products on the market – it literally sticks to the most common construction materials and is semi-flexible. This formula is available in a 10.1 oz size. BOSS 136 is formulated for interior use only and is particularly suited for sealing walls and floors which have been penetrated by pipes, conduits, or electrical cables in all types of construction and for filling interior voids around HVAC, plumbing, and framing. Application is with a standard caulk gun or trowel, and clean up is with water. BOSS 136 is available in 10.1 Fl. Oz. and 28 Fl. Oz. cartridges, 5 gallon pails, and 11 Oz. Net Wt. aerosol cans. A one-part, non combustible, general purpose fire-rated sealant that meets and exceeds the specifications for ASTM E-136 and conforms to all National Building Codes, including BOCA, CABO, SBCCI, ICBO, NFPA and the 2003 International Building Codes. In addition, BOSS 136 Firestop/Draft Sealant has also passed ASTM E-814 (UL 1479), making it the first product to ever pass both of these tests. It is the most versatile firestop product available in today's marketplace.